fern’s first parade. not a fan. The Tuesday before Thanksgiving is always a much anticipated day for me- The day of The Great Appleton Downtown Christmas Parade! This year’s experience, while not quite as comfortable as years past, with temperatures in the low 20s, was still well worth braving the cold for. Thankfully, we held a prime spot in front of a friend’s upper apartment. He invited our whole group in to warm up with hot cider. The miserably bitter wind didn’t take away from the sense of community that the Christmas parade always delivers. There’s something special about doing something as ridiculous as freezing on a cold curb with friends, watching fellow Appletonians parade by with messages of Peace on Earth and such. As always, there were too many marching bands, but between them were some pretty impressive floats. Some old, some new- all amazingly immaculate to our small people. Just about anything on a flatbed trailer, being pulled by a large diesel vehicle blasting holiday music is impressive for a preschooler. Watching the sparkle of wonder in their eyes for those 45 minutes of parade make the whole year’s anticipation well worth it. mid day holding our spot! 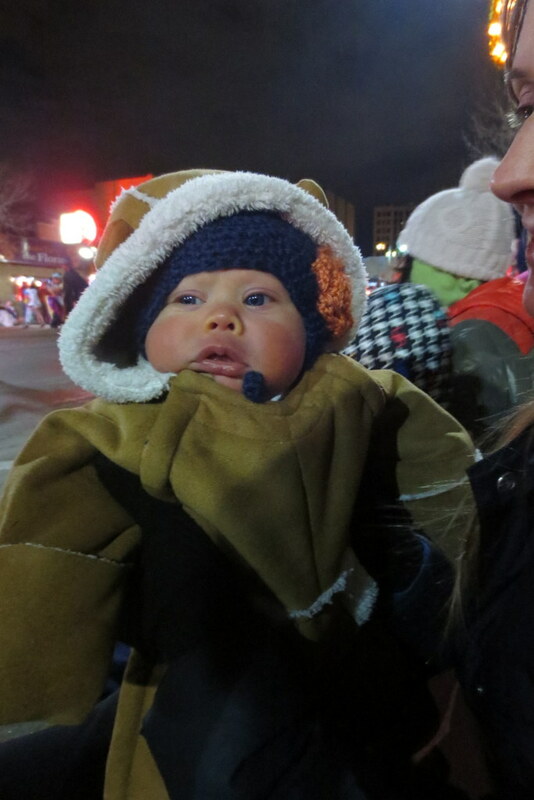 visiting from MKE for her first Christmas parade, LUCY B! new parents again. loving this.